The Three Bears, a Little Golden Book illustrated by F. Rojankovsky, perfectly pictures how Goldilocks and the Three Bears look in my mind. The story is familiar, but as with many fairy tales, the ending differs a bit with each telling. I like that in this book Goldilocks runs away,never to be seen again. Much less violent than being eaten or and more just than being invited to visit again, as in other versions I have read. The illustrations of each character, as well as the porridge and different pieces of furniture, are colorful and capture the imagination. Pros: The illustrations are wonderful! 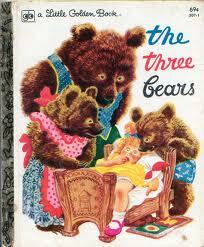 The story is the best I have found of The Three Bears. Cons: I do wish Goldilocks had at least a bit of punishment for her actions, even it if was only that she was frightened enough never to try breaking into someone’s house again! 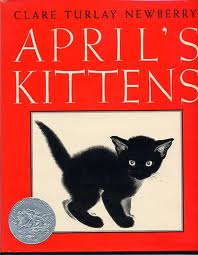 I am quite surprised that April’s Kittens by Clare Turlay Newberry achieved the status of a Caldecott Honor Book. While I really enjoyed the story, the pictures were not what I would consider worthy of this award. In this book April’s cat has three kittens. Since her family lives in a small apartment in New York City, her father says she can only keep one cat. She loves all of the cats, but is faced with giving away the adult cat in order to keep her favorite kitten. Finally, April’s parents decide it is time to move into a larger home,as the family has outgrown their current accommodations. This move will allow April to keep both her cat and her very favorite kitten. 1. “Excellence of execution in the artistic technique employed.” – While I was not impressed with the artwork as a whole, the faces and expressions of the kittens were very life-like. 2. “Excellence of pictorial interpretation of story, theme, or concept.” – I felt that much more could have been done artistically to enhance the storyline.3.“Appropriateness of style of illustration to the story, theme or concept.” – The love that Aprilfelt for her kittens is well-portrayed visually, so much more that is explained in the story is missing in the illustrations.4.“Delineation of plot, theme, characters, setting, mood or information through the pictures.” – April is only seen twice in the book, a little boy who is a minor character gets an entire page, and the rest of the illustrations are of the cats. I would have liked to see April’s parents and her surroundings, too. The simplicity of April’s life is evident. The changes in mood throughout the story are not as obvious as they could be. 5.“Excellence of presentation in recognition of a child audience.” – While my girls liked this story, I found them zoning out visually and not even looking at the pictures. 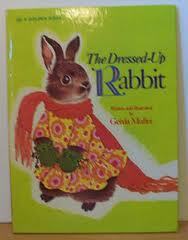 In The Dressed-Up Rabbit by Gerda Muller, Kathy loves exploring the outdoors while she visits her grandmother in the country. Unfortunately, at first she does not know how to effectively investigate the plants and animals. She finds a bunny trapped in the woods and takes him back to her grandmother’s house where she dresses him in doll clothes and takes him for a ride in her doll stroller. When she meets a friend on the road with his dog, the bunny is frightened and runs away, shedding the clothes in his path. At first Kathy is upset, but Mark is able to show her where the bunny lives and how to quietly learn about nature. Pros: This book came at a great time for us as we embark on “Nature Studies” which is an integral part of our homeschool study. I hope that my little girls can learn to be as quiet and patient as Katie became. Cons: I hope my girls don’t try to dress up their guinea pig or any other unsuspecting creature! 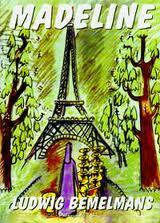 Madeline by Ludwig Bemelmans tells of a little French girl who lives in a boarding house with eleven other girls and their caregiver. The ever-attentive Ms. Clavel awakens to realize that something is wrong. Madeline, who has been crying, is whisked away to have an appendectomy. The other little girls visit her lavish hospital room and decide that they want to be in the hospital, too. While this story may sound silly, the rhyming verses and classic illustrations make this book a joy to read over and over. Subsequent books in this series are equally enchanting and allow the reader to get to know Madeline and her companions further. 1. “Excellence of execution in the artistic technique employed.” – The almost impressionistic illustrations are full of detail, yet not cluttered. 2. “Excellence of pictorial interpretation of story, theme, or concept.” – With a high picture-to-word ratio, I feel like I am turning pages constantly, and must read the story slowly to be able to take it all in, but every scene is pictured in detail. 3.“Appropriateness of style of illustration to the story, theme or concept.” – The impressionistic-like drawings and paintings allow the reader to sense the French setting for this story. I cannot help but hear a French accent as I read this book. 4.“Delineation of plot, theme, characters, setting, mood or information through the pictures.” – Once again, the “Frenchness” of the illustrations, which include scenes of famous Parisian landmarks, is clear throughout the book. The characters are less detailed, but given that they are introduced as 12 little girls in 2 rows, it seems appropriate for them to be less defined. 5.“Excellence of presentation in recognition of a child audience.” – My girls love this book and have asked to check it out from the library several times. While the scenes of Paris are lost on them (and probably me for the most part! ), I hope they will remember these pictures, as they may encounter them in the future. Yellow and Pink by William Steig begins as what one might think is light-hearted story about two wooden dolls, but quickly the reader find that this book is much deeper philosophically. The dolls begin to wonder who made them when one of them suggests the ridiculous possibility that they may have started when a tree branch fell on a sharp rock and split just perfectly to form their legs. This line of reasoning continues very comically, but the reader is also aware of the implications the story has as to the real origin of our own lives. 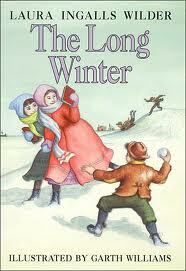 Even though the storyline is quite complex, it is told in such a way that younger children can understand the meaning. Pros: A philosophically complex story with real meaning for everyone. The story is related in a way that is easy for children to understand. Cons: I wish at the end they had taken the next step to clearly relate who truly was their maker. 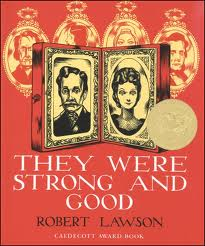 They Were Strong and Good by Robert Lawson tells the stories of the author’s parents and grandparents in short biographical form. Each from very different backgrounds as a Scottish sea captain, a Dutch girl, and a Southern gentleman who was a preacher and fought in the Civil War, the stories vary greatly in length and interest value. I had read this book to my children over a year ago and found it boring. With this reading, I found the beginning of the book to be entertaining and age-appropriate for my children, but the later part of the book seemed to drag on. The small-line drawings are incredibly intricate and again, fun in the early part of the book, but less engaging as the book progresses. 1. “Excellence of execution in the artistic technique employed.” – Very detailed, small-line, black and white drawings. 2. “Excellence of pictorial interpretation of story, theme, or concept.” – Each individual story is thoroughlyexplained through the illustrations. 3. “Appropriateness of style of illustration to the story, theme or concept.” – The old-fashioned look of the pictures matchesthe overall storyline. 4.“Delineation of plot, theme, characters, setting, mood or information through the pictures.” – The overall plot and theme are lost, but each story is made clear through the pictures. The settings and characters are very obvious. 5.“Excellence of presentation in recognition of a child audience.” – My children enjoyed the illustrations near the beginning of the book, but lost interest as the book when on.